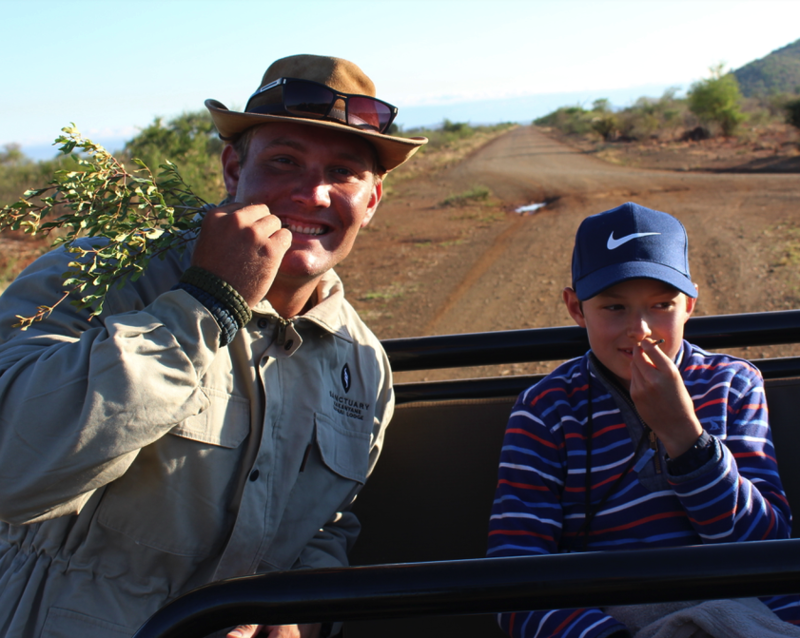 MADIKWE GAME RESERVE, SOUTH AFRICA — Jack Frater thinks his older sister really missed out. 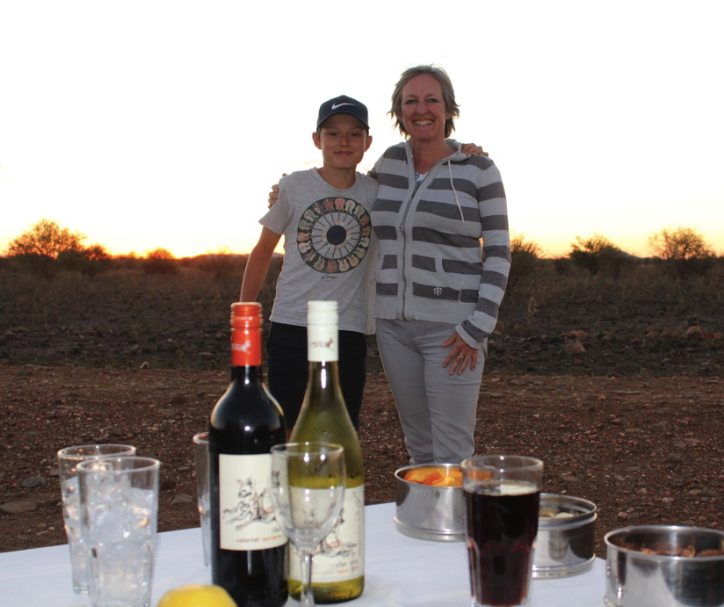 His mom offered a trip to each of her three children on their 13th birthdays to the Sanctuary Makanyane Safari Lodge in the huge Madikwe Game Preserve of South Africa. Jack turned 13 a few weeks ago. “I didn’t think I’d reach heaven so young,” was what he told his mom when he saw their huge room with its glass wall facing the river where elephants swim. His middle sister opted for the One & Only Cape Town instead. This eight room luxe lodge isn’t typically a place for kids. In fact, those under 12 aren’t permitted. An exception was made when Michelle Obama brought her daughters here in 2011. That’s why two years after he died, she scattered his ashes here and why she wanted her children to experience a place that was so special to their dad. As for her middle daughter who at the moment prefers cities, “I wasn’t going to forcer her,” she said. As for Jack, he liked the gourmet dinner–duck breast! And he didn’t mind too much getting up at 5 a.m. to go see the animals in the morning. As for Jack, he liked the gourmet dinner–duck breast! And all the hot chocolate he wanted. And then, there were the lions—two lionesses and two cubs walking right by our vehicle, seeming to look straight at us but not paying us the slightest mind. They had more important things on their mind. The lions had just polished off a Wildebeet—we watched as one of the lionesses finished eating—it reminding me of getting the last bits out of a lobster. And now they were thirsty, in a bit of a food coma and strolling to a nearby watering hole. It was just before sunset and we couldn’t believe our luck. We’d already seen two White Rhinos, giraffes, zebra, elephants, cheetah, crocodiles and umpteen birds during our two game drives. 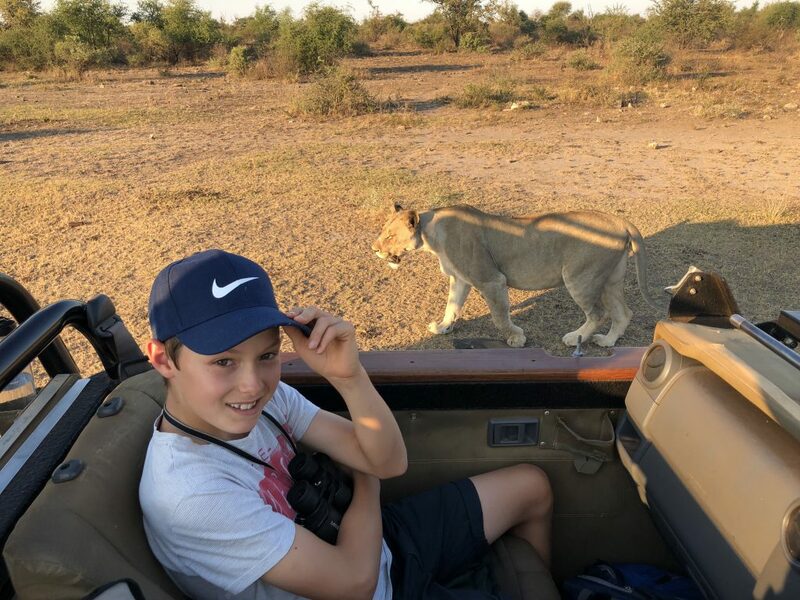 Jack had seen lions before –in Kruger National Park—but had never seen them eating. d walked by us not even six feet from our vehicle, but then returned to watch first black backed jackals and then spotted hyena munch on the lions’ leftovers, vying for what little was left. “We’re watching the entire story,” Jo Frater said, adding she had never before had witnessed such a site. The animals may be sleeping when you find them. But then there is a one-for the –memory books afternoon, complete with a dung-spitting contest between Grimsell and Jack while the rest of us took pictures as the sun was setting. A day Jack, his mom hopes, he will remember always and a new connection to the dad he never knew.